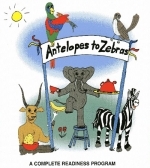 Antelopes to Zebras is a complete readiness program designed to prepare three, four, or five year old children for school and instill in your child a love for reading. This program doesn’t require that the child be ready to write. Students can trace with a finger to learn the proper formation of letters and numbers before they are ready to trace with a pencil. Antelopes to Zebras works for ALL children because of the unique, scientific research based approach utilized through the program. It utilizes a multi-sensory approach that accommodates all learning styles. The child hears it, sees it, thinks it, points to it, says it, writes it and sings it. The phonics instruction is correlated to the reading materials provided in the curriculum. The vocabulary is totally controlled in the 51 stories because ONLY letter-sounds that have been learned or irregular words that have been taught as sight words are used. Beginning in the sixth week of the program, students actually begin blending sounds and decoding words. The actual reading process begins with the teacher/parent reading the story, pointing to each word as it is read. The child is then encouraged to read words, sentences, or the entire story depending upon the level of readiness. Comprehension of what is being read begins in the first story. Oral comprehension dialogue is included for all levels, followed by written comprehension activities, allowing the child who can to write words. For the child who is not yet ready to write, a cut and paste method is also provided as an alternative. Mastery of each letter-sound is emphasized by teaching the name and sound of a letter by saying it, writing it, and blending the new sound with other known sounds and decoding words. The alphabet is always presented with lower case letters first (aA bB cC dD eE) since they are more prevalent in reading and writing. Songs and audio of proper pronunciation of sounds are available on the CD to enhance retention of the letters and sounds. Games are also a key ingredient to making learning more fun. The teacher’s manuals are scripted and require no preparation time. Anyone who can read can teach a child to read with this program. An easy-to-use assessment system is also included. 3. Teach each page as instructed. You will be instructed as to when to click on icons below to hear the music. Antelopes to Zebras is divided into 36 units to correlate with the 36 weeks of a school year. You may teach a unit a week if you wish to complete the program in a school year or you may simply use the program at the best pace for your child. 5. ENJOY! Have fun! Learning should be a rewarding experience for both student and teacher. A musically based phonics, reading, spelling & writing program. An innovative beginning reading/language arts program by Dr. Jane Hodges.